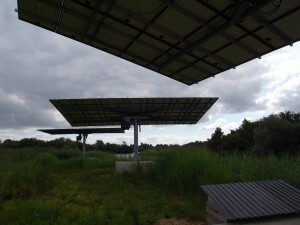 After the great weather we had in July 2013, we thought it was time to investigate the increased output for the solar tracker system installed in 2011. What we found was not we expected … Please read the full report to find out how July was the only month it performed to target and all the other months it has been well above its predicted outputs. Please find the full report here Dual Axis Tracker Energy Output of a Solar PV installation in the UK. 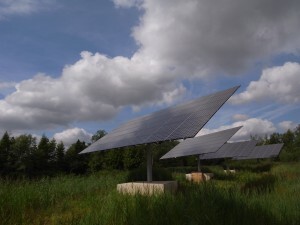 The report highlights the need for further studies of Solar Tracker systems in UK as up until now there are very few of this type installed throughout the country. If the results shown in the report can be confirmed systems may be performing 60-65% better than static ground mounted systems with the UKs weather conditions. The control system installed on the trackers moves the PV panels around so that even on an overcast day the panels positioned in the direction of the most energy available at the time. The system seems to be performing 70-100% better in these conditions than fixed panel installations, see pictures below how the system faces the direction of the energy. Please read the report to see full set of data from the installation.